You must make reservations at least 5 minutes in advance of the time at Liberty Hound. You can access Liberty Hounds Parking lot through the Municipal Housing lot across the street. The are forty spaces with Signage reserved closest to restaurant and Naval Park. (Please only park in spots labeled "Liberty Hound Parking". A short walk from the last stop of the metro rail. Seafood focused staple of Canalside now open year round! 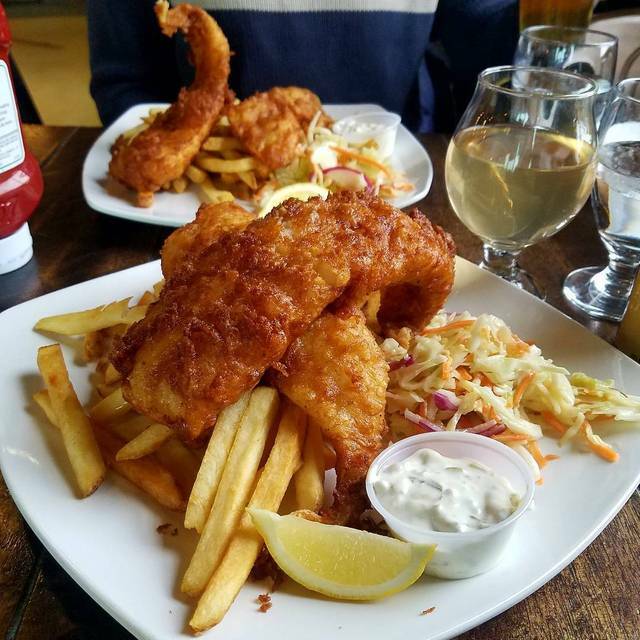 We serve the very best seafood, sandwiches, appetizers and entrees (and have something for the kids as well). The full service bar offers up fine cocktails, spirits, wine and an fantastic assortment of both draft beer and cans. Walking distance to the arena and all that the downtown waterfront has to offer, with free parking for patrons. 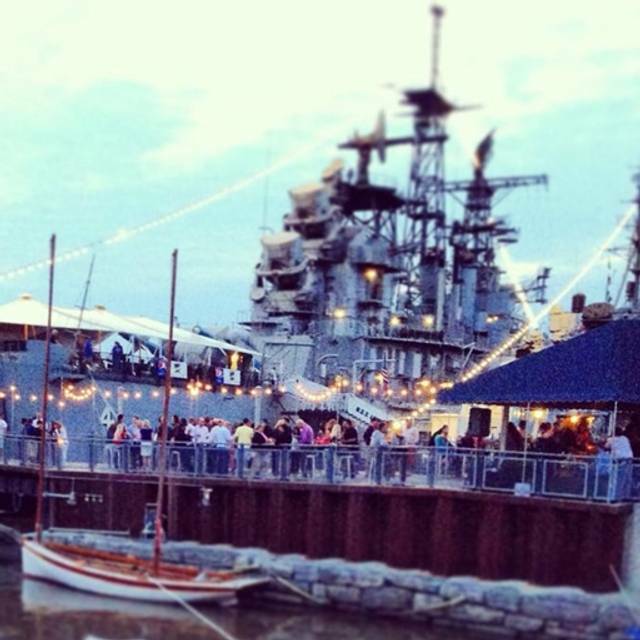 A fixture of Buffalo's beautiful waterfront, we look forward to welcoming you to Liberty Hound; we ARE Summer in Buffalo! Overall a great place - food, service, location - just too noisy!! Great food and atmosphere. The service was exceptional for as busy as they were. Going back in the summer for the outdoor experience. Awesome service and food on a very busy night. Highly recommend. Such a great lunch, as usual. 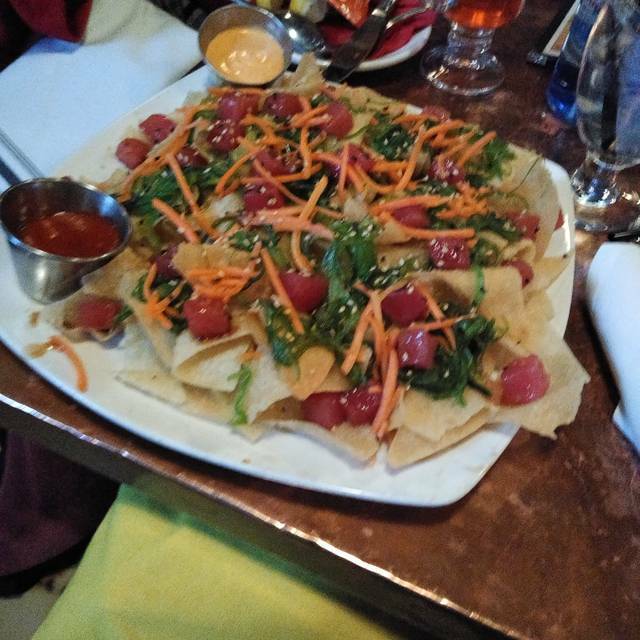 Ahi Tuna Nachos are so good, even when the tuna was gone, I took the wonton chips home! Lobster grilled cheese sandwich is amazing! My mom's Liberty burger medium rare was PERFECTLY done. This is not common! Love this place! A little noisy, but hey - it is a bar. 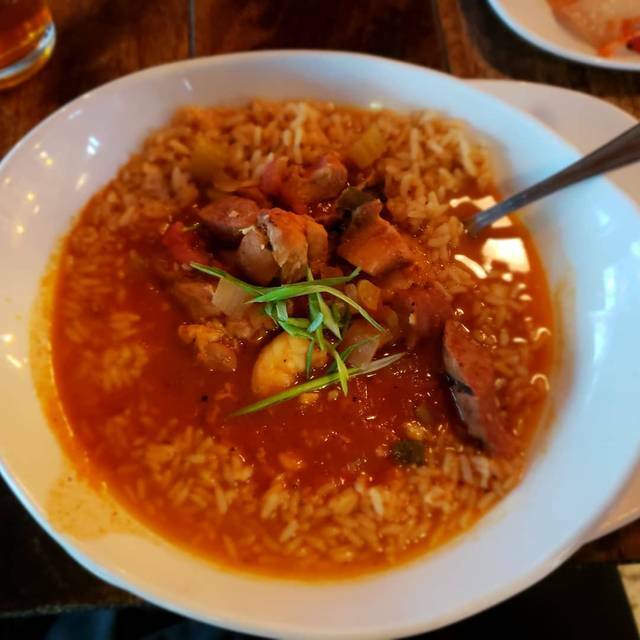 Great Fisherman's Stew, good beer selection and great views of the Naval Exhibit - even though still a little wintry in Buffalo. I come in for the Ahi Tuna Nachos, I love them so much I make them at home now! Yours need more tuna, it's more chips but everything else is perfect! Your salads are delicious, lots of drink options and really friendly staff! Great food. Service wasn't good. Waiter hardly checked on us and when he did, he forgot some things we had asked for. The waiter was rude. Brought the entrees out before we had even come close to finishing our apps let alone our soups. Timing was absolutely terrible. I commented on that my dinner would be cold and he just laughed. Seated on time - great service as well as food. We were going to Sabre game so needed to be in and out in less than an hour. If there is ever a time you need to clear your sinuses, I recommend getting the tuna nachos. However, there is a larger problem at hand. The host and waiter do not seem to appreciate dad jokes as much as they should, and that's problematic. After my date had dropped an absolute nuke of a dad joke, it received little to no appreciation, and I'm talking "the mother load of all bombs" type of dad joke. It just saddened my heart to have witnessed that. I left that nice establishment thinking one question and one question only, what has happened to humanity? Food was great! 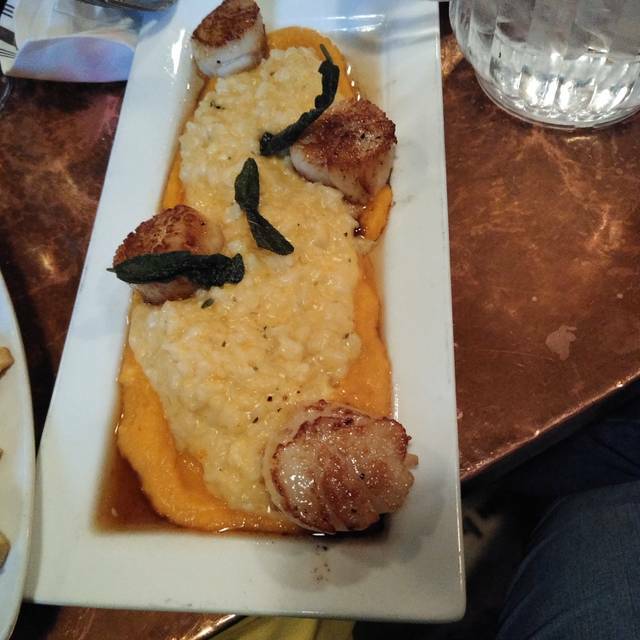 Scallops were cooked perfectly! Can't wait to go back to try other menu items! Seated when we arrived, our server was great and very knowledgeable...able to answer all our questions. Food arrived nice and hot and was delicious. Great menu choices. Noise level was a bit loud but not so bad that you couldn't talk. 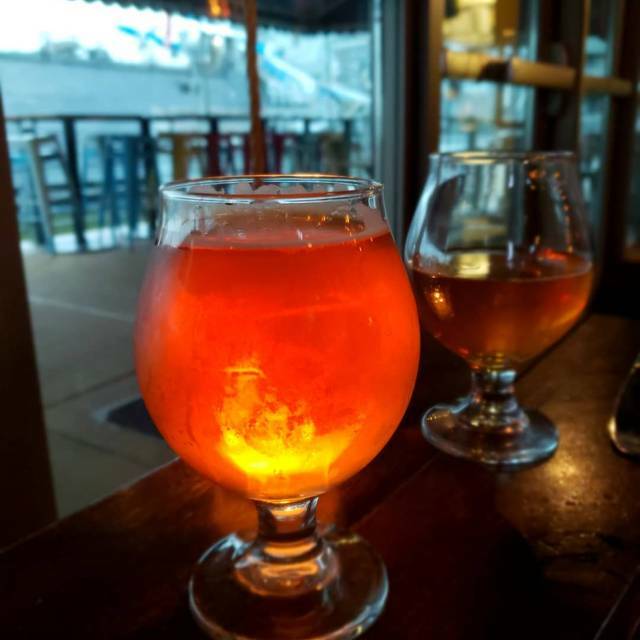 We went to the Liberty Hound right before a concert and we couldn’t have been more pleased with the experience. We added 1 to our reservation last minute and they accommodated without any fuss. The drinks were wonderful; appetizers were delicious (get the tuna nachos), and the dinner portions were very generous. Prices were reasonable. Service was great! The chicken wings were the worst I've had in 30 years. I specifically asked for "extra crispy", and they arrived undercooked to a rubberlike consistency. I will not order them again, nor will i recommend them. Gray food and huge portions at really reasonable prices. Nice craft beer menu. In the summer, this would be a great place to hang out as a stop to a waterfront walk! It is also super close to KeyBank for a meal before an event. Great location and good specialty food! Love the variety of seafood. Food and service was great. Parking was a little difficult and ended up paying to park in a lot. Other than that two thumbs up. Great food, cooked perfectly. Close to the hockey game and the Navy museum kept my kids happy which meant everyone was happy! Portions were huge so we would share meals next time. Looking forward to returning. We made our first visit to this place before a Sabres game. I had the roast beef sandwich which was very good. My wife opted for jambalaya and she liked it very much. Server was friendly and efficient. The food was great. My broil fish was good but could have been cook more. Drinks were good my husband had the fish fry. Great portions, loved the French fries. Service was great. Told all my friends. Keep up the good work. The baked cod was great! The Reuben special fell flat and really didn’t have much flavor. Definitely make a reservation or you will be waiting. Great spot on event nights! Very neat place on the water. Great service and food was well prepared and not expensive. Food and service was excellent, as usual. If I could give more than 5 stars I would. My family and I were coming in from out of town for a concert across the street through a bad snow storm. We were 2 hours late for our reservation and they still sat us, got us fed and out the door before the show started. Every other restaurant in the area was booked do to the show. They went above and beyond. They were friendly, fast and the food was unbelievably delicious. I will stop here anytime I'm in town and a HUGE thank you to the staff from myself and my family. Great meal, waiter was super! Outstanding before the concert. So glad they are staying. 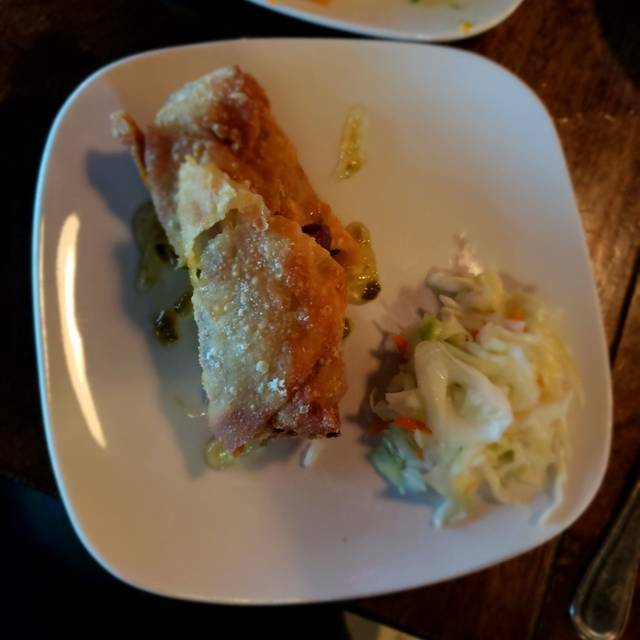 We were there on a cold night so it is difficult to rate what the outside ambiance is like but our food was very good as was our service and the price was reasonable. I would recommend it for a nice dinner. Always a good time when in Buffalo! Recommend for good food and fun. Great choices- food and service was excellent. We especially enjoyed the Hungarian pepper dip and bakes cod with lobster sauce! Good food for a decent price. Little hard to get to the building in the snow but we managed. Great service. Two of us had the same meal but portions were disproportionate. The food was amazing! Mom got the Ahi Tuna "nachos". They use fried wontons (of all things) in place of actual nachos and it was great so was everything else on the table (photos below). Really good meal in the middle of January. Our server was awesome, food was delicious, portions huge and well worth the reasonable price. We also purchased 2 memorable pint glasses.